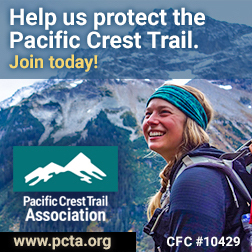 The Pacific Crest Trail symbolizes everything there is to love and protect in the Western US. From deep forests to majestic mountain ranges, we help to protect and preserve this 2,650-mile trail for hikers and equestrians to experience and enjoy. In 1991, Pete "Pickaxe" Fish of Ventura, Calif., retired after 33 years as a geologist and set out to hike the Pacific Crest Trail (PCT). Along the way he met Alice Krueper, another hiker who also organized Pacific Crest Trail Association (PCTA) trail crews in Southern California. Over the next five years, Pete hiked the PCT from Mexico to Canada (2,650 miles through California, Oregon and Washington) and performed thousands of hours of trail maintenance with Alice's PCTA crews. When Alice succumbed to cancer in 1996, Pete took over her position as volunteer PCTA Trail Coordinator. "The projects were so much fun," says Pete, "somebody needed to carry on." Now in his 70s, Pete doesn't show any signs of quitting. Wearing overalls covered with PCTA patches, he's still comfortable wielding a chain saw, building water bars, and grubbing out root balls. Pete spends 100 days annually on the trail with a whip saw, shovel or axe. He spends another 100 days identifying necessary projects, sharpening tools, recruiting volunteers, shopping for supplies, and carting everything back and forth to the trail. "It's a fulltime job with him," says Jerry Stone, a fellow PCTA volunteer, "and he's totally devoted to it."